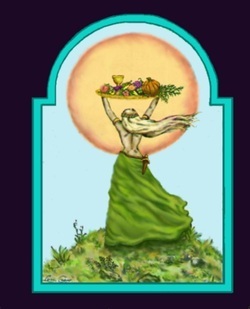 Also known as Lughnasadh, Lammas or Lunasa. Lammas is the "cross-quarter" day marking the first harvest of early grain, where the first loaf of the bread from the harvest is broken and shared in the name of the Goddess. All crops associated with grain and of the season are sacred to this time. Much festivity is coincident with Lammas in Australia, with Australia Day being marked on January 26. It is a time to reflect on the successes of the year and to reward yourself for jobs well done. Lammas magic can be magic of facing up to change. The God gives his energy to the crops to ensure life while the Goddess, as Mother, prepares to transform into her aspect as the Crone. The God loses his strength as the days grow shorter.